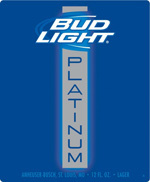 ST. LOUIS, MO – Bud Light, the world’s best-selling beer, will add to its portfolio when the brand debuts Bud Light Platinum in early 2012. With a slightly sweeter taste, higher alcohol by volume (6%) and signature cobalt blue glass bottle, Bud Light Platinum provides beer drinkers an upscale light beer option as a companion to their social agenda. Bud Light Platinum will hit store shelves nationwide Jan. 30, 2012. Details on the marketing campaign to support Bud Light Platinum’s national rollout will be provided at a later date. Brewed at Anheuser-Busch’s Baldwinsville, Cartersville and Los Angeles breweries, Bud Light Platinum is available in 12-ounce glass bottles in six- and 12-packs.